Packaging: 10 ml glass bottle. Aroma: heady, fresh, floral and sweet. Main properties: anti-depressant, tonic, euphoric, relaxing, aphrodisiac, antiseptic, anti-cellulite, anti-inflammatory, antitussive, astringent, astringent, appetite stimulant, diuretic, deodorizing, analgesic, healing, reduces sweating. Effects on body: Clary sage oil prevents wrinkles, balances oily skin, removes cellulite and stretch marks and relieves irritated skin. Stimulates hair growth. Used as an antiseptic and for respiratory system illnesses, inflammation of gums and toothache. Increases appetite, used against low blood pressure, dizziness, headache, excessive sweating of armpits and palms, rheumatic diseases and muscle pain. Relieves hot flashes during menopause, regulates sweating in the intimate parts, helps in vaginal discharge. 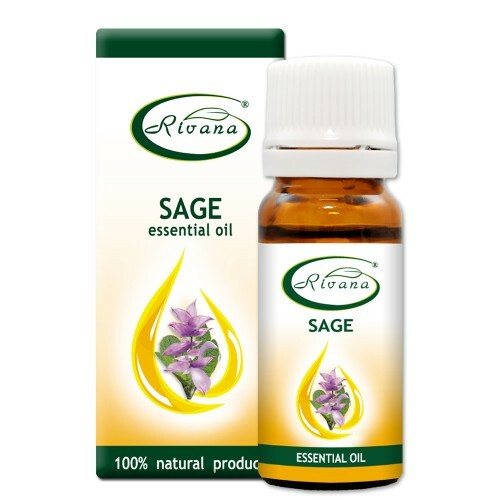 Stimulates the production of tarragon and the menstrual cycle, favours conception. Impact on the mind and spirit: Clary sage oil causes both excitement and relaxation. Strengthens the spirit, restores hope and faith in your own abilities, relieves stress and weakness, enhances concentration of the mind. Aromatic lamp: aphrodisiac, tonic, antiseptic -5.6drops of sage oil. Aroma Pendant: headache, dizziness, deodorizing, antiseptic – 1.2 drops of sage oil. Bath: aphrodisiac, tonic, when having cellulite, stretch marks, muscle tension – 6.8 drops of sage oil. Massage: tonic, aphrodisiac, for cellulite, muscle pain: 25 drops of sage oil to 50 ml. of base oil / almond, avocado, apricot, grape seed /. Enrichment of face creams: for oily skin and acne – 10 drops of sage oil to 25ml. of cream. Aroma Spray: tonic, aphrodisiac, deodorizing, antibacterial – 15-20 drops of sage oil to 250ml water, shake the bottle and spray the room. Contraindicated for people with individual intolerance to sage. Attention! Highly concentrated! Store tightly sealed in a place without direct sunlight. Keep away from children! Note: The information presented on the site has introductory nature. For treatment, consult an aromatherapist or a doctor!